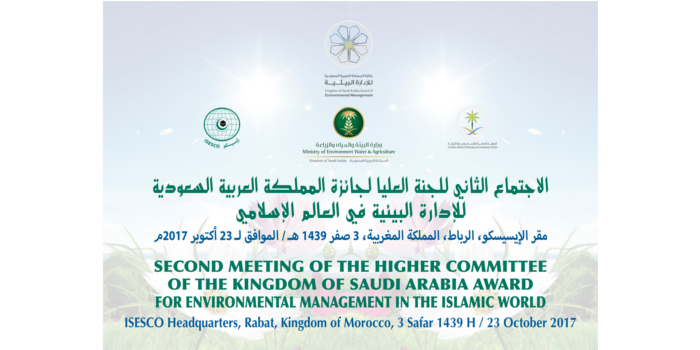 Higher Committee of Kingdom of Saudi Arabia (KSA) Award for Environmental Management in Islamic World was held in Rabat on 23 October 2017 at ISESCO Headquarter. Under the chairmanship of Dr. Khaleel bin Mosleh Al Thaqafi, President of the General Authority of Meteorology and Environmental Protection of the Kingdom of Saudi Arabia, President of the Award’s Higher Committee, and Dr. Abdulaziz Othman Altwaijri, ISESCO Director General, Secretary General of the Award. 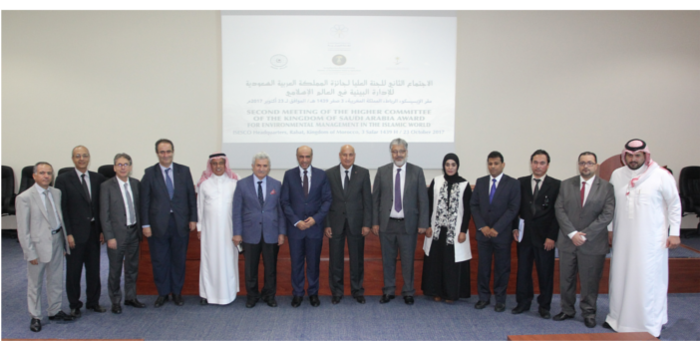 The ISESCO hosted the 2nd meeting of the Higher Committee of Kingdom of of Saudi Arabia (KSA) Award for Environmental Management in Islamic World. In this meeting, the committee discussed and approved the report of the Award’s jury (edition 2016-2017) and the progress report. The meeting also involves the preparation of the award of the next edition (2018-2019) with a new category called the “Environmentally-friendly Islamic City”. The Award of the Kingdom of Saudi Arabia for Environmental Management in the Islamic World rewards outstanding works carried out by individuals and institutions and organizations of the private or public sector operating in the various fields pertaining to the environment and sustainable development in Islamic states, in recognition of their substantial contributions to reconciling the environment and socio-economic development through a holistic and integrated approach favouring the fulfillment of the 2030 Sustainable Development Goals, in line with the Islamic principles calling for the sustainability of the world’s resources to fulfill humanity resources. 1. Achievement or practice in the environment and sustainable development. 2. Best practice in environment and sustainable development projects or activities in the public sector in the Member States. In addition to its President and Secretary General, the Higher Committee comprises the following members: Dr Mahathir Mohamad, ex-Prime Minister of Malaysia, ISESCO Goodwill Ambassador; Mr Pa Ousman Jarju, Director of the Country Programming Division at the South Korea-based Green Climate Fund; Dr Mukhtar Ahmad, Chairman of the Higher Education Commission in Pakistan; Dr Mohammed Bin Ibrahim Al Tuwaijri, ex-Assistant Secretary-General for Economic Affairs in the League of Arab States; and Dr Ibrahim Ozdemir, Founding Rector of Hasan Kalyoncu University in Turkey. The prizes will be awarded to the winners at the opening session of the 7th Islamic Conference of Environment Ministers which is due to be held at ISESCO headquarters in Rabat, 25- 26 October 2017.